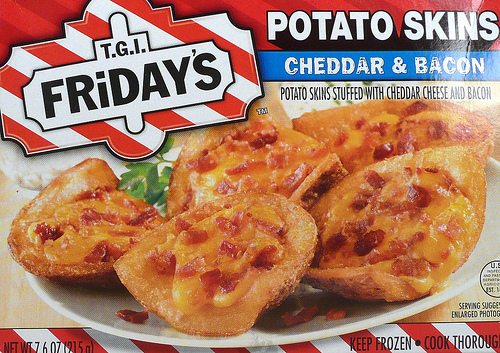 This post is filed under Bacon, Cheese, Frozen, Hall of Fame (Looks), Oven, Potato, TGI Friday's. I wonder if they serve these in the restaurant. 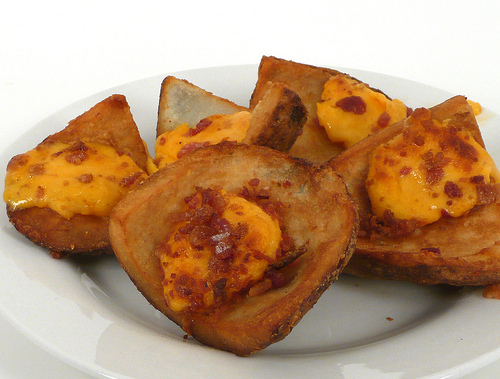 These have way too much potato taste and not nearly enough cheese-and-bacon taste for my taste. Taste. Nah OddBoyOut, they don’t serve these ones in the restaurant, they make actual (and good) potato skins for in house, this was just them trying to jump on the frozen food bandwagon. I don’t think I’ve actually gasped before at the difference between the box and the real thing. That is the worst-looking piece of “food” I’ve ever seen. May I recommend a complete lipid profile and cholesterol screening after consuming this and all above products. Since you have cut the half potatoes in half again all the cheese and bacon runs onto the baking sheet when baked. Will not buy this brand now. I used to buy 2-3 boxes a week.